Nearly 20 years in the making but now printed. 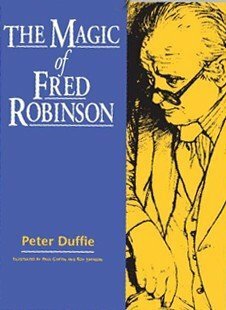 The Magic of Fred Robinson may well be the most anxiously-awaited book amongst magicians the world over. It has been in the making for years and Martin Breese had had literally hundreds and hundreds of emails and letters asking when it would be released. Finally it has been printed. Martin believes that it will be the most significant magic book of this decade. Fred Robinson was a private man but his skill at sleight-of-hand with cards and coins was legendary. He could be found at the Magic Circle on Monday evenings and many well-known names from around the world paid homage to Fred and traveled countless miles to witness for themselves his legendary skills. He was the editor of Pabular magazine and inspired contributions from the finest magicians of his time. The Magic of Fred Robinson documents and describes every effect that Fred performed. It has been written by Peter Duffie who has skilfully described all of Fred's sleights and effects in the greatest of detail. There are pages of detailed drawings by Paul Griffin and Roy Johnson and photographs and the book pays tribute to one of the greatest sleight-of-hand magicians the world has ever known. Many magicians have contributed to this book.